Last Minute Flash! Yours truly attended the 2013 Blackjack Ball on Jan. 26th and I finished in a tie for 5th place (with Anthony Curtis) in the challenging Blackjack Ball Test that was administered to the 102 blackjack pros in attendance. Next month, I'll include a copy of the test in the BJI, report on who made it to the final round, and who won the coveted Grosjean Cup. This month's issue of BJI contains blackjack reports from the Stratosphere and Palace Station casinos in Las Vegas (by Stu D. Hoss); Binion's, California, D Las Vegas,and El Cortez casinos located in downtown Las Vegas (by KC Brooks); Hollywood, Argosy, Isle of Capri, Ameristar, and Harrah's casinos located in Kansas City (by JPB); and a Tunica trip report (by Riverboat Flyer). Vinny DeCarlo completes his two part series on secret casino scams (this time with photos showing how some of the scams work). You'll find two book excerpts in this issue. One gives the details on how to make $100 an hour playing double-deck games (by Bill "The GameMaster Channels), and the second is the amazing story of blackjack pro Kevin Blackwood's visit to a casino in Mississippi and another in Wendover (by Kevin Blackwood). If you want to learn how to win more money when you play blackjack by focusing on the "big" hands and worrying less about the "small" hands, read Basil Nestor's article, "Follow The Money." For craps players, Frank Scoblete explains why the worst trend in craps is to follow the trends. Last, but not least, we have the schedule of upcoming blackjack tournaments courtesy of blackjacktournaments.com. E-mail subscribers can also read each month's issue online at our web site: BJI Issue #157, February 2013. 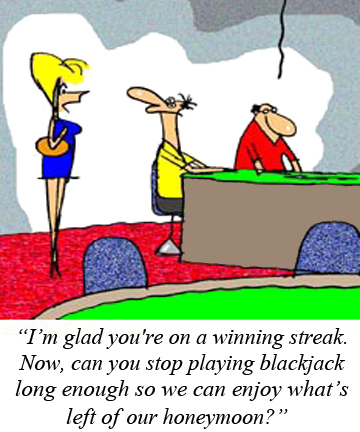 Blackjack Insider e-Newsletter ONLY $19.95!! Learn to beat the casinos! $100 in free gifts with a new membership! Offer not valid on subscription renewals. New member subscriptions only. "An excerpt from Bill Channel's excellent new book, The (Darn Near) Complete Book of Winning at Blackjack..."
"The conclusion of Vinny DeCarlo's two-part article summarizing 15 unbelievable (but true) casino scams..."
"An excerpt from Blackwood's Legends of Blackjack e-book about The Counter..."
"Missouri is one of the few areas where a card counter cannot be banned from playing. Unfortunately, the Missouri casinos will take countermeasures to thwart the card counter. In the January issue of BJI, I covered the largest market in Missouri-St. Louis. This month, I'll cover the second largest market-Kansas City..."
"At an early morning session, it was just me and another player. Penetration was better than last night, at about 1.7 decks cut off out of six decks. This made the high counts last longer. This time my splits and doubles with large bets were working. In 1.5 hours, I finished ahead 37 units..."
Read Riverboat Flyer's complete article. "My next three reports are going to concentrate on twelve downtown casinos on or around Fremont Street. This month I'll report on playing conditions at Binion's, California, D Las Vegas, and the El Cortez casinos..."
"Despite very different addresses, these two properties have one thing in common, namely, they aren't catering to or looking for "whales" or high-rollers. They offer economically priced rooms, gaming, and amenities at a fraction of the cost you'll find further south on Las Vegas Boulevard. One offers significantly better gaming opportunities, while the other has a few more nifty 'bells and whistles.' Let's get started..."
"Basic strategy covers hundreds of moves laid out with clear precision (if A then B), and some of them seem downright amazing, perhaps because they're so counterintuitive. For example, you should surrender 16 against a dealer's 10 (if possible), but you should split the hand when the 16 is 8-8. In other words, you put more money on the table when it's a pair..."
"The most prevalent system used by craps players falls into the 'trend betting' realm. There are positive and negative trend betting schemes such as..."